The completed instrument will contain 51 stops, or voices, and almost 3,000 pipes. 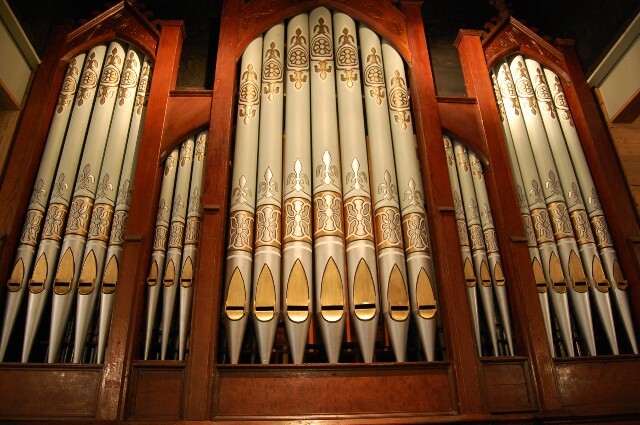 Trinity Episcopal Church in Moorestown will dedicate its newly renovated pipe organ with a recital featuring concert organist Mark Laubach on Sunday, Oct. 23, at 4:00 p.m. The recital marks the culmination of a major two-year project, and the realization of the parish’s dream of once again having a pipe organ in good working condition. With a theme of Inspiring Worship for Years to Come, a capital campaign raised over $250,000 to rebuild the console, fix mechanical and tonal problems and add several sets of new pipes. Chuck Gibson and his crew, from Pipe Organ Specialties in Monroeville, are carrying out the work. The completed instrument will contain 51 stops, or voices and almost 3,000 pipes, ranging in length from 16 feet to just a couple of inches, controlled by a console with three keyboards and a pedal board. Barre, Pa. He has performed in many of the most prominent churches and concert halls in the United States, Great Britain and Germany, including Westminster Abbey and St. Paul’s Cathedral in London. He has recorded three critically acclaimed compact discs on the Pro Organo label: Teutonic Titanics, French Fest, and Mosaics in Sound. Andrew Stowell, son of Susan and The Rev. Philip Stowell, who was rector at the time. Andrew died suddenly in August 2014 at age 26, and many of the donations to the capital campaign were given in his memory. A commemorative plaque was placed on the wall near the entrance to the organ chamber, next to the pulpit where Fr. Stowell preached for 20 years. The recital is open to the public at no charge. A free will offering will be gratefully accepted. Trinity Church is located at 207 West Main Street at the corner of Church and Main streets. For more information call (856) 235–0811.